In the dead of winter, with heads buried in piles of homework or deep in a scarf, kids can only reminisce about days spent diving, splashing, hiking, running and relishing sunny days at summer camp. But that's the time to make summer plans. As parents realize the importance of an active lifestyle, outdoor activities, and independent living for their children, camp is becoming an integral part of summer vacation. With more camps, charities and tax breaks providing more financial aid than ever before, spots can fill up unexpectedly. Families looking for a summer camp must begin their search as early as possible in order to snag the one that will provide their kids with the right activities, atmosphere, and friends to complete the summer experience. Choose a type of camp. The choices in the type of camp go far beyond day vs. overnight. Residential camps offer the quintessential camp experience – think canoes, campfires, cabins, and mess halls, and a blend a variety of sports, artistic, and social activities. Specialized camps provide a more immersive opportunity to practice a certain sport, art, educational field, or language. Fitness camps instill valuable lifestyle habits, faith-based camps provide spiritual guidance in a casual environment, and special needs camps are designed to accommodate unique children and their necessities. Family camps are also becoming a popular option to strengthen family bonds. Parents and children should discuss their camp options together to come up with a wish list for priority location, activities and amenities. Is the proximity of a camp important, or does your child have their heart set on portage trips? Is your child keen on sports, horseback riding, drama or rock climbing? Are you looking for a wilderness experience? As part of this list, families can determine other factors, such as budget and safety. An Internet search should follow, which will provide a number of potential camps. A useful tool is the search engine found on www.camps.ca, which allows users to select different options to easily target their search. Another good one is the Ontario Camping Association's website. Discuss what to expect from camp (such as activities, routines and schedules). Talk about the fun and exciting things they are likely to experience. Mention the new friends they are likely to make. Help them to have realistic expectations. Explain that there will be rules to follow, and there will be ups and downs. Prepare first-time sleepover campers for bedtime away from home. Discuss things that might help them to fall asleep, such as reading a favourite book. Encourage independence by explaining how to care for their belongings. Do they know what to do with dirty laundry or a wet bathing suit? Ask about visiting policies ahead of time. Some camps have a scheduled visiting day, others don’t. Camps have varying procedures about making telephone calls—when a child can call home, when a parent can call and how messages will be relayed. Find out ahead of time and share the information with your child. Do not share feelings of anxiety or doubt with your child. You have thoughtfully chosen a camp, so now have confidence in your decision. Remember that going to camp is a wonderful experience. Share the joy by talking about the adventure ahead. If only summer camp could last forever. More than one camper has been known to wistfully say so as their session came to an end. How long should a child spend at summer camp? Is your child a first-time camper or a seasoned veteran? Is your child looking to be immersed in a particular specialty or are they interested in exposure to a broad range of experiences? What are your family’s overall plans for the summer? What is your family’s budget? A younger child may do well with just a week. Some residential camps even have sessions for part of the week for their youngest campers. A seasoned camper may want to spend a month or even the whole summer at their favourite camp. 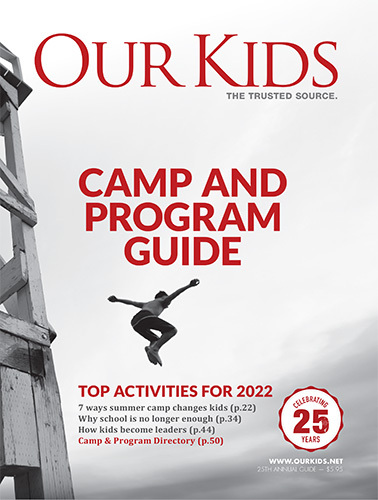 Day campers might want to experience a series of one- or two-week camps over the course of the summer, or may opt for an extended session in a specialized camp program.